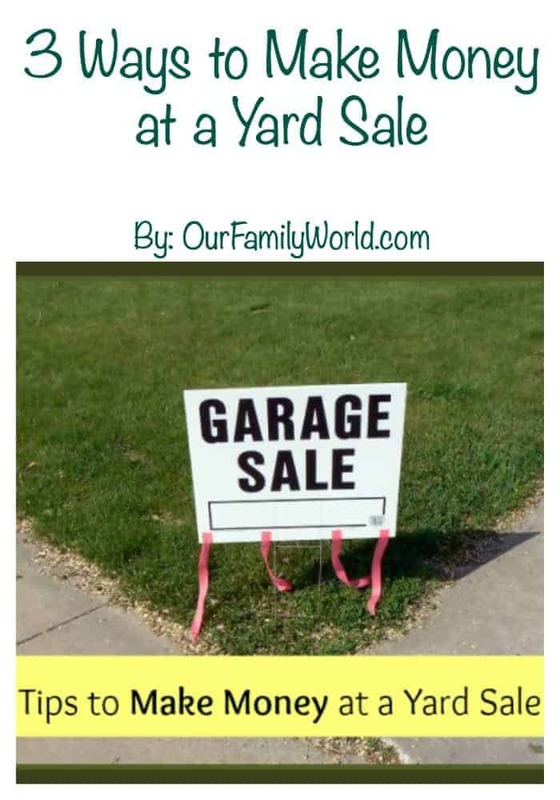 Planning a yard sale? Check out our ways to make money by selling your stuff! Post contains affiliate links. When I was a child, my mom and I would spend our Saturday mornings going to yard sales. We would often talk about having one of our yard sales, but never got around to it. Now that I am an adult with a family of my own, I have one annually, not only to get some extra cash, but because I really don’t like clutter. Over the years I have learned a few things about yard sales and the different ways to make money by getting rid of our unwanted stuff. One of the ways to make money is by making others feel welcome by being friendly. Not just because it is polite, but because you will increase your chances of sales. Have you ever gone to a garage sale, looked around and noticed how bored and uninterested the hosts looked? It always makes me feel like I’m intruding and it makes others feel the same way. However, when people are friendly, give me a big smile and ask me how I’m doing, I almost feel like I am talking to a friend. Nine times out of ten I buy something, even if it’s something I didn’t want or need. Some people will throw all their clothes in a box and put a sign on it saying how much the items cost. But how will people find what is in their size? How will they know if there is anything there that fits their style? The answer is that they won’t. The majority of people will only go through the first top pieces and then move on. One of the ways to make money is to make it easy for customers to find what you are selling. If it’s buried in a pile, they aren’t going to find it very easily. What you should do is arrange the clothes by size. You can do this by folding them neatly on a table or putting each size in a separate box, clearly labeled. Don’t throw the clothes in there, but fold them neatly so it’s easier for people to see what you have. This also applies to DVD’s, books or anything else where people will have to do some “digging” to find what they want. The whole point of a yard sale is so you can get rid of stuff and the buyers can get a great deal. But you also want to make a profit. One of the ways to make money at a yard sale is by pricing your items just a bit higher, but not greedily so. The only reason you are doing this is because most buyers know how to negotiate and will try to bring your price down. If you originally priced it high, then you have a better chance of getting a fair price after negotiations. There are a lot of different ways to make money at a yard sale. Just be sure the items you are selling work… if they don’t, then be honest about it. Don’t take advantage of your customers and everyone will come out a winner in the end. Now go clean out those closets and garage and make some extra money! Do you have any tips on ways to make money at a yard sale? Very helpful tips. I wish some people who run yard sales would read “Be Friendly” 🙂 So many are sour pusses. I add a box by the road with a big sign, “Free Stuff” to bring people in. I also suggest going through and re-marking items at a lower price if they haven’t sold in a certain amount of time. While the goal is to make money, my ultimate goal is to NOT have the stuff in the garage sale reappear in my home later. That is a very good idea, Danielle. You are right, I don’t want to bring (or haul) that stuff back inside! I think pricing is important. A lot of people think that you have to basically give stuff away for nothing – like clothing for .25 a piece. But in reality, at a yard sale most people who will pay .25 for a shirt would gladly pay .75 or $1 for the same item and pricing all of your clothing items for .75 instead of .25 can make a big difference in profit if you have a lot to sell. Even goodwill sells shirts for like $3.50 and jeansf or $5 so $1 a piece is still a really great deal. You are absolutely right, Emily – I don’t hesitate to buy shirts for $1 – it’s a great deal! This is a great post for we have been debating – donating vs yard sale. This will help with that decision! Great tips. However, if you price your items too high people will pass on them or try to negotiate deals. Thanks for commenting, Christy! Yes, I only raise them a tad, I also tend to walk away if things are priced too highly at garage sales. I went to a sale once and the clothes were priced like they were in a retail store! Needless to say, I walked away without buying a thing.